"Burn him at the stake," cries an angry critic. 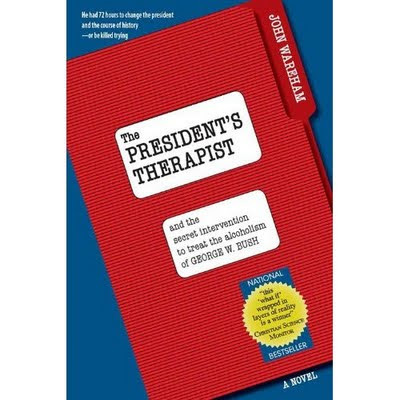 The President's Therapist, John Wareham's best-selling psychological thriller, is looking more like more like nonfiction by the moment. The novel delivers an insider's portal into [former] President Geroge W. Bush's closet alcohol addiction, leadership travails, and marital woes. In a missive to the publisher, Republican political activist Ms. Bonnie Dudley accused Mr. Wareham of comingling fact with fiction, and of stealing his plot from a supermarket tabloid. "She has a point," responded Mr. Wareham. "The bio-history of George W. Bush is factual, and I certainly pushed the novelistic envelope by creating a fictional psychotherapist. But she's all wrong about the plot, it's original." The novel might be fiction, but the bio-history that "Dr. Alter" unearths and ruminates upon is deadly accurate, and the strategies he applies to burst the president’s infamous bubble of denial are, to say the least, fascinating. ***Note: The book is available on Amazon HERE for as little as $3 used, $9 new.